In the spider world it appears there are three types of widows; true widows, false widows and false false widows. You could argue that a true widow is a false false widow, but that’s going around in circles! Obviously there is a similarity between the false widow spiders and members of the black widow family. 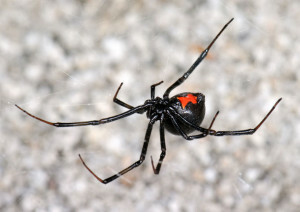 Fortunately the black widow is not native to the UK so there should be no reason for any confusion here. However there are several species of spider that do bear some resemblance to the false widows and frequently result in mistaken identity. This common garden spider is also known as the silver-sided sector spider and is found in gardens around the UK. Its favourite place to build a web is on window frames where it builds an intricate orb web (very different to the tangle of false widow webs). 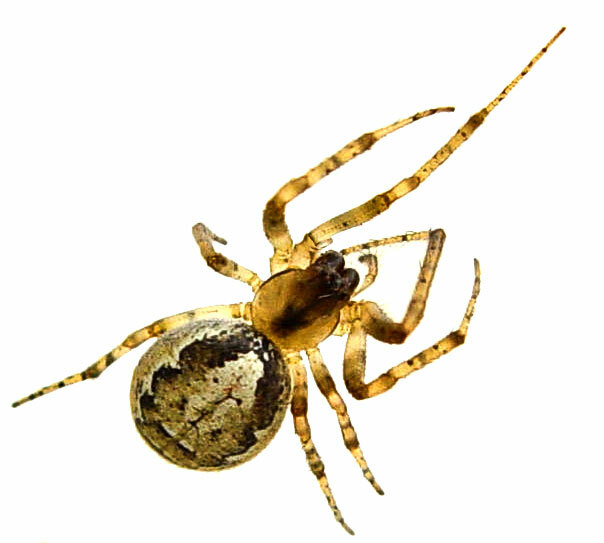 Slightly smaller than the false widow, Zygiella has a very similar shape characterised by a bulbous abdomen. The legs and carapace also have slightly glossy, orangey/yellow appearance, but this is lighter than that of the false widows. The legs also usually have a visible banding pattern.Zygiella is completely harmless to humans and can be found in homes throughout the UK where it does a good job catching more harmful bugs such as flies and mosquitos. The lace web spiders have always been common throughout the UK . The name comes from the lacey web they will construct around the entrance to a hole or crack – they are a type of funnel web spider. They are usually found outdoors but will come indoors, particularly the smaller males. 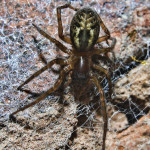 The lace webs are capable of giving a painful bite, although not as severe as the false widow. 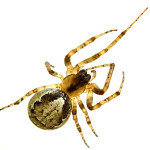 There are similarities in appearance with the false widow spiders such as brown / orange legs and carapace and markings on the upper side of the abdomen. They are roughly the same size too. However, the markings differ, forming a series of ‘V’ shapes and there is less of a cream colouring. In addition the abdomen is less bulbous than that of the Steatoda species.Perhaps the most unsavoury thing about the lace web spider is what happens when the new spiders emerge from their eggs. Around 40 are laid in a silk chamber and upon hatching the mother actively encourages them to devour her!